The most supported reason why I want to watch this movie is the actors. The main actors in this movie are James McAvoy whom I adore since he played in Narnia as Mr. Tumnus, and Daniel Radcliffe whom I like watching him grow up since he played in the greatest serial movie of all time, Harry Potter. Those man support the movie to attract many audiences, and it works. It is because I and my friend also wanted to watch the movie because of the actors. I like James McAvoy and my friend obsesses with Daniel Radcliffe. However, if you do not like them, or just probably want to know the story of the movie, just watch it. The first scene I saw that Daniel played as a clown of the circus who is really smart, because he likes to read. Maybe, someone who thinks rationally will say it is impossible, because how a clown with only have a little book can smart equally like a doctor. Then, Victor who is played by James McAvoy, was impressed with the skill of the clown. Therefore, he helped him out from the circus to be his assistant in doing something illogical. Victor who really obsessed with his passion, wanted to make something dead alive again. There are many barriers and tense scenes since they have to be chased by the cops and chasing their creature. However, there are some jokes that include in this movie to strengthen the character of Victor. Overall, I can say that the story is great because of the great acts from the main casts. Another thing that I like from this movie is that the graphic that is shown in this movie. There are many scenes that show the inside of the body like bones, bloods and vines in someone’s alive. The scenes are when Victor try to surgery and built the creatures. The bones and the vines are noted like a sketch in a sketching-pepper. It is really artistic and smart. Makes me know how the inside of the body is. If you curious, try to watch it. I really recommend this movie to you. I do not know how others judge this movie, saying that it is the failure one. From my perspective, it is a great one with great acts, great actions and great story. I love how insane Victor is, and I love the dialogue in it. If you expect that this movie has many actions as Transformer or really mysterious as Sherlock Holmes, just keep them in your mind. Don’t expect too much. Just follow the story and you will like it, because it has surprises in many scenes that make you cannot predict what happens next. 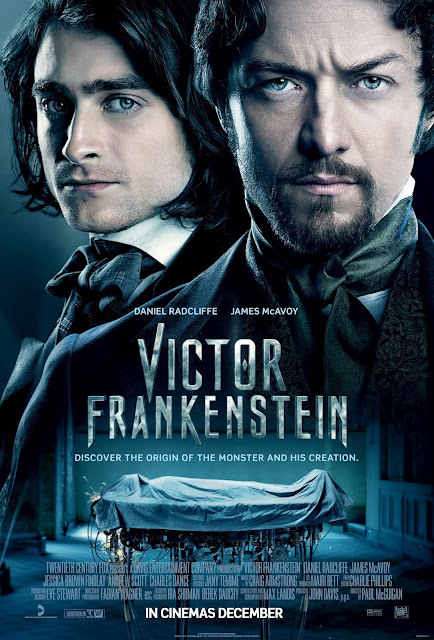 Enjoy the story of the maker of Frankenstein.